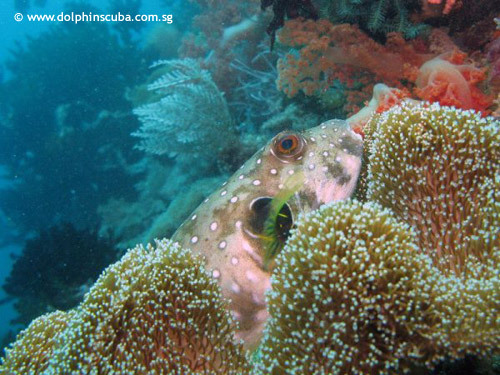 The area of Donsol is known as one of the best spots to dive, swim and snorkel with many whale sharks. The area just north of the town Donsol is known for its whale shark encounters locally known as butanding. The deep San Bernardo Strait pushes healthy plankton rich waters to the area of Donsol, attracting whale sharks between December and May. It is located in the province of Sorsogon in the Bicol Region at the southern part of Luzon. Between March and April chances are high that you are swimming, snorkeling or diving amongst more than ten different whale sharks at the same tour. Other things you might do around Donsol are climbing the perfect cone of Mayon Volcano near Legaspi or join a firefly tour through the mangroves seeing thousands of small lights in the trees. There are also some other dive sites in the area near Ticao Island and San Miguel Island. A dive spot named Manta Bowl has become famous obviously because of the numerous visits of mantas it receives.